Adam Darowski recently had a good article on Reuschel and his Hall of Fame worthiness. See Beyond ERA+: Why Rick Reuschel Had Hall of Fame Value. Adam uses some of the more advanced fielding stats. 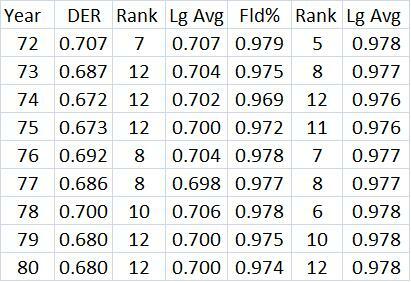 Here I will just look at DER (defensive efficiency rating) and fielding pct. But first, I came up with an approximate relative ERA for Reuschel and then converted that into Wins Above Replacement (WAR). I found all the pitchers from 1920-2011 with 2000+ IPs from the Lee Sinins Complete Baseball Encyclopedia. I also found their ERA, walks, strikeouts and HRs all relative to the league average. I ran a regression with relative ERA as the dependent variable and the others as independent variables. The 108 means his ERA was 8 lower than the league average (this is without park adjustments). The 95 menas he struck out 5% fewer batters than average. His predicted relative ERA was 114, good for 64th out of the 293 pitchers. Not a super high rank, but good. He is ahead of Hall of Famers Juan Marichal and Jim Bunning, who each had around the same number of IP as Reuschel. If I use the predicted relative ERA for each pitcher and base it on a league average of 4.00 and a replacement level of .400, Reuschel would finish 38th or in the top 13%. He is ahead of Marichal, Jim Palmer, Whitey Ford and Ted Lyons, just to name a few Hall of Famers. Remember that I am not making any park adjustments. From 1972 –1984, the years Reuschel was on the Cubs, he was 23rd among all major league pitchers with 1000+ IP in HRs allowed relative to the league average. He allowed 25% HRs fewer than the average pitcher would have, pitching in Wrigley Field! Wrigley was a great HR park during this period, compared to other NL parks, allowing 42% more HRs than average. Now this is all based on defense independent stats. Maybe one reason we don't see how great Reuschel is that the defense behind him was not very good. 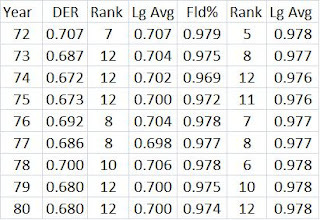 The table below shows how the Cubs ranked in DER (defensive efficiency rating) and fielding pct for the years when Reuschel pitched alot for them. DER is just what % of balls in play are turned into outs. They were last 5 of these 9 years and Reuschel only pitched 129 innings in 1972 and well over 200 the rest of the years. They did not do too well in fielding pct, either. 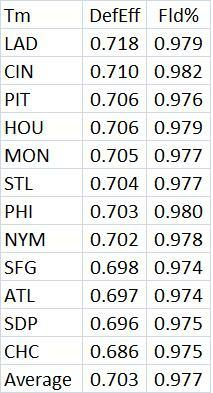 This next table shows the simple average for all the NL teams in these years. 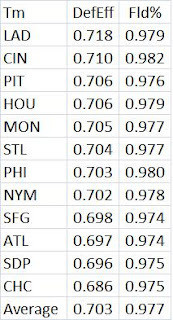 The Cubs were by far the worst in DER and were still below average in fielding pct.